Thanksgiving parties traditionally revolve around a meal, including the leftovers, but Thanksgiving party favors can be more than just boxed up turkey, potatoes and stuffing. From symbolic items to fun trinkets, party favors help the spirit of sharing and togetherness last long past that last bite of pumpkin pie. Children love small trinkets they can take home as their very own, whether they are from a birthday party, holiday get together or even Thanksgiving dinner. Favors for children should be age-appropriate (no choking hazards or complicated games), related to the event, and relatively indestructible. When in doubt, hosts can ask parents about the appropriateness of items and what may be suitable for specific children. Edible Thanksgiving party favors should complement the event without being so filling that children will lose their appetites for the delicious dinner to come. A few seeds or berries, properly explained, can be a tasty favor as well as educational and interesting. These themed party favors will keep the Thanksgiving spirit alive beyond the dinner table. The key to a great favor for adults is to look for something that is more than just a trinket to take home. By choosing an elegant or useful item, the party host has provided one more reason for everyone to give thanks. 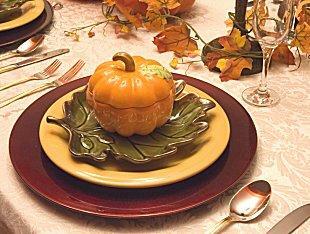 Display Thanksgiving party favors as part of the table décor, if the meal is to be the central activity of the event. Favors should either be placed on each guest's plate prior to the meal, or they can be incorporated into the decor as place card holders, next to the glasses or silverware, or grouped together as a centerpiece. If the party will not include the traditional dinner, the favors can be used to decorate a snack table, mantle, or other focal point of the location. They can even be handed out as guests depart. Thanksgiving favors are easy to find throughout the fall harvest season. Check local party supply stores to see what they have in their inventory. If you want to create the favors from scratch, check out craft supply stores in November for the best supplies to make your Thanksgiving favors. For a crafty look without the work, check out autumn craft shows and online shops like Etsy for favors. Beau-Coup carries unique favors such as Maple Leaf Place Card Holders and Turkey Leaf Candle Holders. Party City has favors such as Thanksgiving pencils, glitter stickers and mini top hats. Kate Aspen offers a lot of options for Thanksgiving favors, from personalized bottle stoppers to mini jam pots. 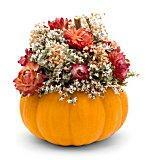 Finally, don't forget to consider using fall wedding favors as elegant Thanksgiving party favors. If personalization is required, use the year or Thanksgiving party theme. You'll find fall favors at wedding retailers like ForeverWed. Many people wonder whether party favors are necessary at all. While there is no strict etiquette dictating that favors are or are not suitable, they are a nice "thank you for attending" token for guests. If chosen and displayed appropriately, Thanksgiving party favors are a delightful remembrance of a happy event, and they are something everyone can be thankful to receive.